In a crock pot/slow cooker combine the onion, chili beans, black beans, corn, tomato sauce, beer, and diced tomatoes. Add the taco seasoning, and mix to combine. Place the chicken on top of the mixture and then push them into the mixture so they are covered. Cover and cook at a low setting for 5 hours or high for 3. At this point you should/can take the chicken out and shred it or cut it into bite sized pieces (let it cool slightly first). 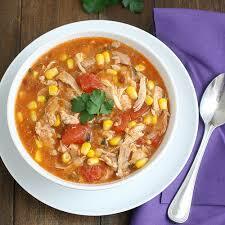 Place the chicken back in the soup and cook an additional 2 to 3 hours on low or 1 hour on high. To serve ladle into bowls and top with parve sour cream, and crushed tortilla chips. Serves 6 to 8 depending on the size of the serving.